The Wolfgang Complete Detailing Tool Bag Kit includes premium Wolfgang paint care products and a handy Detailer’s Tool Bag to carry around your supplies. Take care of your vehicle wherever you are with this complete detailing kit. It’s made for detailers on the go, car show enthusiasts, and anyone who demands a perfect finish. The Wolfgang Detailer’s Tool Bag is a carry-all for your detailing supplies, even your polisher! Just like a carpenter’s tool box, the Wolfgang Detailer’s Tool Bag carries your tools of the trade. This well-made, generously sized organizer holds bottles, buffing pads, brushes, and everything else you need to tackle any detailing job. The entire bag is made of rugged, water resistant, 600 denier nylon canvas. The dimensions are 17 x 13 x 8 inches. Auto Bathe, Wolfgang’s state-of-the-art car wash, is a natural and gentle yet very effective, non-toxic, biodegradable cleanser. It surpasses other similar products in cleansing power and preservation of your car’s surface. This concentrated shampoo gel is built around TUFF SUDS II, foam that suspends natural oils and German “super polymers” within each bubble—allowing built-up dirt and grime to be effortlessly swiped away. 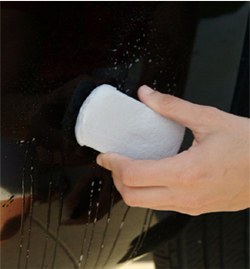 Auto Bathe will not strip wax or any kind of polymer surface protectant from your vehicle. The most thorough car bath cannot rinse away every last bit of embedded residue and overspray that contaminates, and eventually eats away, at your car’s paint. Approximately twice a year you will need to follow the wash with a clay bar treatment. Wolfgang Clay Lubricant is specifically designed to be used with Wolfgang Elastic Poly Clay to create an ultra-fine, slick protective layer between the paint and the clay. This allows the clay to glide across the surface, acting as a magnet for any foreign particles left behind after the wash.
Then rub the clay across the wet area to remove embedded debris. Wolfgang Paintwork Polish Enhancer actually enhances and preserves your car’s surface by deep cleaning to remove embedded dirt and old wax, without abrasives or harsh chemicals. It minimizes swirls and scratches in the paint, making them seem to disappear. When you finish, your car’s surface will be clean and glass-smooth—the best possible surface for applying wax. Simply wipe it on, allow dry until hazy, then buff gently with a cotton or microfiber detail towel to a gorgeous, high-sheen enhanced surface. The Wolfgang Detailer’s Tool Bag Kit transforms an ordinary vehicle into a concours contender. With advanced polymers and cleansers, Wolfgang is the secret to the perfect gloss. Store your entire concours kit inside the organized, rugged Detailer’s Tool Bag. I have been using McGuire's car care stuff for years. I used the Wolfgang items on my first new Harley Davidson. I am impressed. 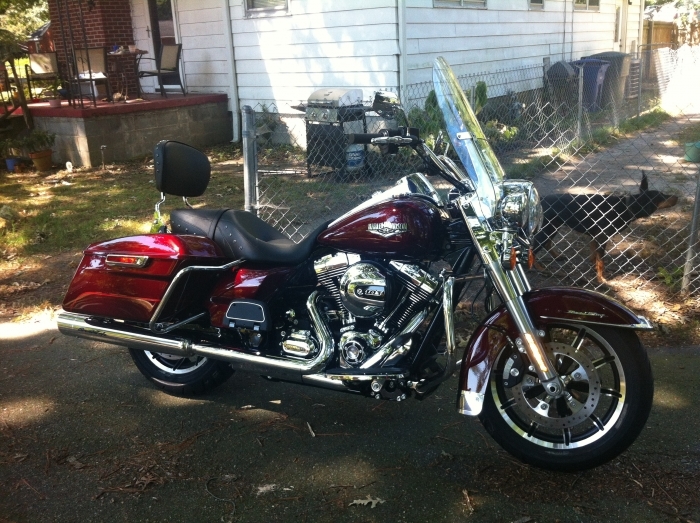 So much that I took the Road King to my parents house to show them. My Dad asked me to do his truck with it. So for Father's day I am taking it with me to detail his truck. I was worried about the price but it is well worth it. Wolfgang is well worth the money!